Evelyn Smith is the Giggles Clown Company. Evelyn has been a professional clown for over 10 years. 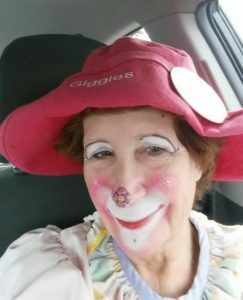 Giggles is a clown for all occasions and can be hired for theme birthday parties, face painting, balloon sculptures, glitter tattoos, and holiday characters. Giggles serves Gloucester, Williamsburg, Newport News, Yorktown, and the Hampton Roads area of Virginia. Evelyn Smith has been a member of the Gloucester Business Professionals for over 17 years.